(Portland, Oregon) - Downtown Portland became a little Gothic in the wee hours of Wednesday, as rain drenched most of Oregon and a hazy, even oppressive, gray filled the sky. 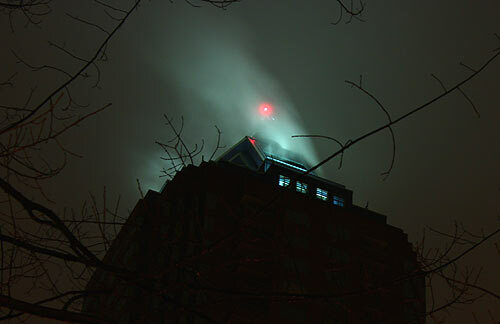 But the downpour on the KOIN Tower created some especially startling sights, as rain fizzled out of existence on the building’s lights and created some freaky, fascinating effects. 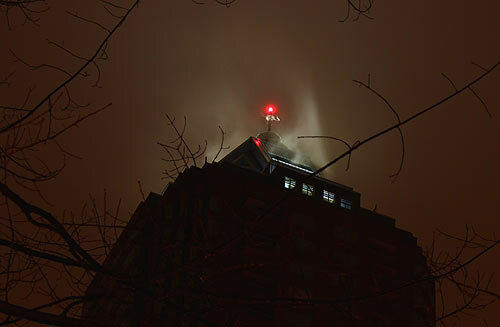 Perhaps it’s just the fog at that elevation, or a combination of the rain and fog, but the top of the KOIN Tower took on a look that seemed straight out of the Batman comics – or perhaps reminiscent of the end of the first Ghost Busters movie. Framed by bare, wintry tree limbs, it appears as if the tip of the structure is steaming in a rather singular stream shooting upwards. Then, depending on the wind, this ghostly wisp of white moves in different directions. This wasn’t the only building with such interesting effects, but it was the only one that could be captured quickly without drenching the delicate lenses of OregonTravelDaily camera equipment. Snow advisories have been issued for the Oregon and northern California Cascades, and inclement travel conditions are to be expected. Some unusual sights can be found in the Portland area in Fall. Check out the surreal conditions of Portland’s Rose Garden at dusk recently, where an otherworldly look takes over normally picture-postcard beauty. Fall colors can explode in some unexpected ways, especially if you can find the time to get a little lost in Washington County’s rather clandestine wine country, where secret vineyards and wild colors abound. Bald eagles have been spotted on the Oregon coast recently, in spite of the crazed weather. Other astonishing beach finds are plentiful, such as many sightings of a rare fish, lots of jellyfish and starfish washing up, and the startling, ancient find someone made recently. Beware of stranded sea lions on the coast, however. They can carry some horrific diseases that can be transferred to humans or dogs.